Honda has planned a salvo for our market and their sole aim is supremacy over Hero. They promised 15 new product launches for our market this year and apart from the Unicorn 160, all others were simple cosmetic touch-ups to the existing vehicles. Hence, the biking enthusiasts are not taking them very seriously. 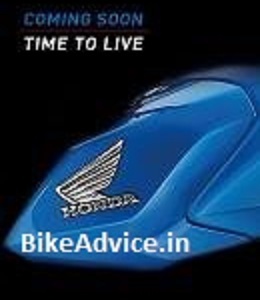 Nonetheless, moving on, we have an exclusive teaser pic of an upcoming Honda motorcycle with an official ‘Coming Soon’ banner and a catchline ‘Time to Live’. The blue tank carries either tank extensions or shrouds at the front and possibly has the traditional old-school fuel tank cap. We tried to compare it with the upcoming Livo, 2015 Trigger and the entry level motorcycle, the trio which we know are coming from Honda, however, it matches none! And this may mean that it is a new motorcycle for our market from the the Japs. Tank volume and current Honda’s fascination towards entry level commuters suggest that this may be another addition to the already massive line-up of 7 odd motorcycles in the 100-125cc commuter segment. But then we will want to be pleasantly surprised when Honda shows us the complete picture..